Why has it been so long since I enjoyed lunch at Swine & Sons? It’s DELICIOUS! The Crispy Chicken Sandwich is AHHHsome! 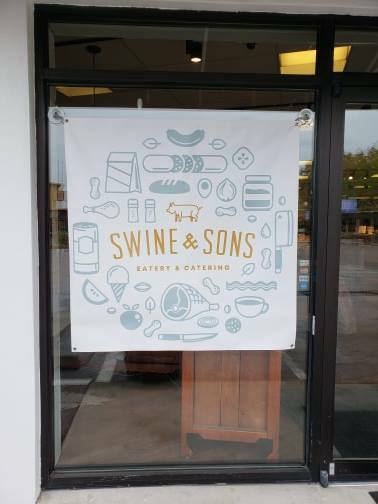 Swine & Sons recently signed up to be one of our Local restaurant lunch providers during the weekdays of the 2019 Winter Park Paint Out which is organized by and based at The Albin Polasek Museum & Gardens. Right now we have four restaurants signed up, with one spot left. So, I used the opportunity to drop by their new Swine & Sons location within The Local Butcher (formerly The Meat House) on Orange Avenue. Da Kine Poke Bowls and Swine & Sons both recently opened within the space and I think it makes a lot of sense. So many concepts these days are not super mass market. Think about all the food trucks roaming our streets in 2019. Food trucks, smaller locations allow for more variety in our Local food scene. And this “food court” sort of approach may well be one we see a lot more of, considering the popularity of spots like East End Market in the Audubon Park Garden District, Plant Street Market in Winter Garden and The Food Factory coming to Oviedo. I missed owner Rhys Gawlak, who was away, but having perused the menu already, I was definitely down for lunch. A few things piqued my interest. 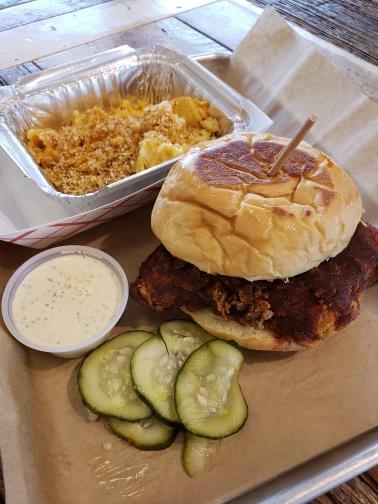 But, as I read over the possibilities, the Crispy Hot Chicken sandwich called out to me. I’m not certain I had ever before had “white barbecue sauce,” had no clue how it would taste. 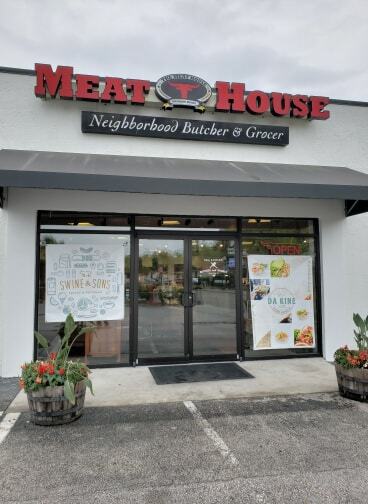 Lunch at The Local Butcher / Meat House? It’s the new location for Swine & Sons and it’s delicious! It was served and visions of the pictures I had seen of it on Facebook & Instagram were soon recalled in my head. The power of a great picture of a delicious sandwich posted to social media. I know it well, as they lead me in all sorts of directions, often how I hear of new things, tasty treats. Not completely certain what I was expecting, but I can tell you it exceeded whatever that was. The flavors were intense and it had some legitimate kick. The chicken breast was meaty and the amount of bread appropriate. I do not always find that to be the case. I happen to LUV spicy and this was the kind of kick that added lots of flavor, but did not leave me sucking ice cubes in an attempt to cool my tongue. Yeah, yeah, I know, you’re supposed to drink milk. I got it with the mac & cheese and it was also delicious. The two together a perfect pairing. I’m not sure how long it had been since I last ate lunch at Swine & Sons, but I know it will not be so long til the next time. The new space is delightful, parking easy, and the food yummy. I should probably have something else when I return; but, now there’s no way I’m not going to have that chicken sandwich in my life sometime again soon! I big 5 LUVs for both Swine & Sons and my delicious lunch! Not sure what they will be serving to our Artists during the Winter Park Paint Out. But I know it will be delicious. 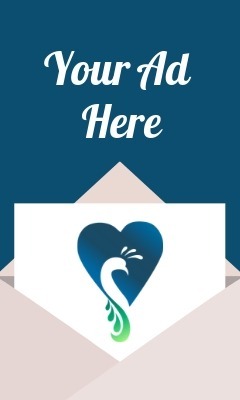 Along with the other restaurants which have signed on to serve our starving Artists — Pepe’s Cantina, Marlowe’s Tavern and Boardwalk Pizza — the folks behind the event, the staff at The Polasek Museum and I appreciate you taking part! If you have a restaurant which would like to fill our final spot for lunch one day that week, please get in touch!